It was 8 p.m. when my brother asked me to check my wait-list movement again, as I’d already checked it an afternoon where there was no movement. I shook my head and uttered “well…I don’t know…” just when he scolded me to try his luck for me. Voilà he said, you’ve made it Simon. Now here I am at IIM Raipur already attended four-day lectures. It was unfortunate that some of us didn’t get to attend the preparatory classes, as we were new joiners, but these four days were enough to pen down my classroom experience. Currently, three colleges, that is, IIT Bhilai, GEC and IIM Raipur, resides inside the same campus which would induce into one’s mind about the lack of proper infrastructure as compared to other IIMs. I too felt the same in the beginning. But after observing the classroom environment, lectures, level of maintenance around the campus and mess, one would definitely not concern about its campus. Thanks to all the managing clubs and committees, everything is up to its level as other IIMs as I have noticed over such a short time span. Great B-schools cannot exist without great groups of students, and the diversity of those students is what many people say makes their B-schools so great. Same is the case with IIM Raipur. I have interacted with students coming from different states. It feels interesting to know them and fun to learn under the same roof. I’ve already learned many things from my colleague and I’m eager to learn more in this two-year course. The classroom is well furnished and has comfortable seats and ambient temperature, well audible speaker setups and ample space to accommodate just the right number of students there should be in a class to focus better. 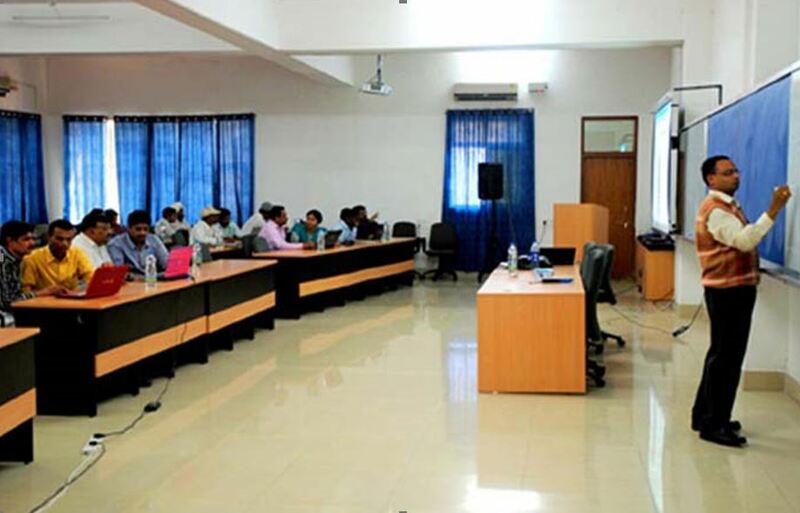 There is a green board, two whiteboards and two projectors so that none of the students finds it difficult to see what is written or presented by the lecturers. Everything feels perfect as it should be for a perfect learning environment. Interactive sessions and discussions also seem to be a good way to express our thoughts which will in time improve our communication skills. Students learn better if they are healthy, and for being healthy they need proper nutrients. Now, as having an ardent interest in food, I would like to talk about the college mess. As the mess is looked after by hostel and mess committee, I would say that they have done a good job in maintaining it. I really love the mess food and how the variety of food items are available at the same time to satisfy the needs of all the students. Now we will be moving to our new campus in a couple of months, and we will get all these benefits in a bigger surrounding. I’m too excited to know that I will get to experience my B-school life on the new campus. I hope that the level of standard and environment doesn’t abate there in the new campus. Among the ABG companies, I would like to work for Aditya Birla Fashion and Retail Limited, as fashion and clothing is something that interests me. Being a part of ABFRL would be exciting for me and also I would encourage fashion among the people in India. ABFRL being a conglomerate of various brands covering each budget segments, I would like to focus more over the lower budget segment as the maximum population of India tends to go for it. Being a part, I would want to contribute to the fashion business to grow and to make people move to a next level in their sense of fashion.